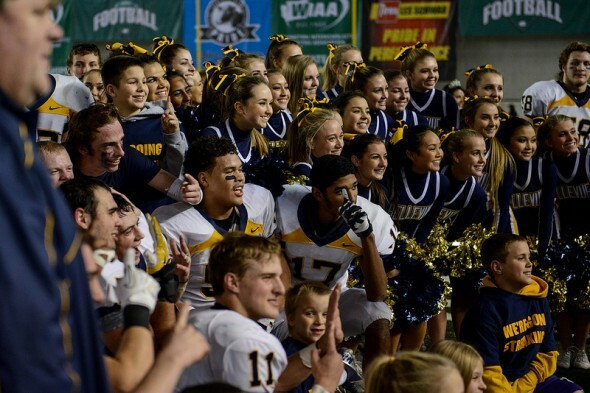 The KingCo League banned Bellevue HS football from the postseason and outside donations for four years Tuesday, citing a “preponderance of evidence” that significant violations occurred. A panel of Kingco League athletics directors imposed sanctions on its most successful football program at Bellevue High School Tuesday. Basing its decision on a “preponderance of evidence” that the violations occurred, the panel issued a four-year ban on post-season play for the Wolverines and exiled for the same period the program’s booster group. Additionally, the board believed the program had been responsible for coordinating tuition payments for players who attended The Academic Institute, a private alternative high school in Bellevue that former teachers had labeled a “diploma mill.” The information was based on a 68-page report commissioned by the WIAA and released April 26 as well as a supplemental investigation conducted by the Bellevue School District. Unaddressed, but in jeopardy, were the 11 state championships won over the 15-year tenure of Goncharoff, whose firing was recommended by the BSD. The voiding of the titles is within the administrative purview of the Washington Interscholastic Activities Association, the governing body for state prep sports. Goncharoff addressed a packed meeting of the Bellevue School District Tuesday. Saying the sanctions were wrong, he claimed, “This has been a setup since day one . . . somebody please stand up and fight back. He left the room to a rousing ovation led by many Bellevue football players and their parents. His plea apparently was heard by the BSD, which nevertheless had already recommended his firing. Superintendent Dr. Tim Mills said at the meeting that an appeal of the Kingco sanctions could be ready as soon as Monday. The panel, representing all members of a 16-team conference that stretches from Mount Si to Mercer Island, also agreed that some players used fake addresses to gain eligibility and that the program failed to self-report a host of violations, including payments from a coach to a player’s family. The board said there had not been a violation with players using the Academic Institute to retain eligibility, nor that athletes had received subsidized housing to retain eligibility, nor that coaches had specifically directed students to attend the Academic Institute. The program is banned from the postseason through the 2019 season. Additionally, the team may not play any games that are not a part of the 3A League regular season for two years. The team cannot play any out-of-state opponents for four years. The varsity will also be unable to win the league title, regardless of its record, through the 2019 season. Sanctions to coaches followed the guidelines outlined by the Bellevue School District. A letter obtained by KING 5 May 21 from the Bellevue School District to Goncharoff informed the coach that the district was recommending that he be fired for his role in the scandal. Assistant coach Pat Jones has been told his contract would not be renewed, and has filed an unfair labor practice complaint with the Public Employment Relations Commission. Coaches will be barred from taking any part in the program, including clinics, speaking engagements, and contact with players or future players. The booster club admitted to paying $60,000 a year for what it described as “non-football activities,” but claims the payments did not violate WIAA rules. The booster club has come out swinging. Before the sanctions were announced, a letter circulated to members by booster club president and former Microsoft CFO John Connors stated that the club was pursuing options for litigation to overturn any potential sanctions and the possible termination of coaching staff. It appears the conference adopted – without a critical eye — the flawed rule interpretations and false inferences on which the WIAA report was based. The evidence shows that the practices KingCo now is penalizing — including summer sports camps for kids and paying coaches for extra work outside of the season — were approved by Bellevue School District and are shared by many, many area schools. These efforts were and are fully within the rules. More importantly, the four-year penalties will fall mainly on kids who had nothing to do with this dispute. Robbing our kids’ right to compete is not the solution, nor is depriving them of the ability to receive the same booster support that other area teams receive. Supporting athletics, the arts, and other extracurricular activities is precisely what the community should be doing, and the conference’s action sets a precedent that should raise a red flag to everyone. We will continue to defend our right, and the right of booster clubs around the state, to make these activities available to kids. The club itself was sanctioned by the panel, ordering that the football program may receive no outside donations of money, equipment, products or services for four years. In essence, the program will only receive funding from the district-approved budgeting process, though the committee said that Bellevue’s athletic director may appeal this sanction in spring 2018 and have it rescinded if the school convinces Kingco that it has put rules in place to properly oversee the boosters. Transfer students will also have to provide the school district with substantial evidence that they are living at their listed addresses in order to play. Requirements include residency contracts, copies of rental or sales agreements for the address in question signed by a parent or legal guardian, and a utility bill for the residence with the parent or guardian’s name on it. The WIAA executive committee is due to meet later in the month. The committee clarified that it felt that illegally recruited athletes should be regarded as ineligible, but that it felt that it was up to the school district and the WIAA to determine if those athletes had participated in contests. Kingco added that if the WIAA stripped state titles from Bellevue for fielding ineligible players, it would strip any Kingco title that the program had earned in the same year. Bellevue was doing this stuff way back when I was there and Interlake LONG before Butch ever got there. He just did it more and won which brought more attention to it. And Kingco and everyone else knew it so for them to act surprised now is BS. My guess is you started it. Punish the adults not the players, why should the kids suffer for the actions of the supervisors? Because those kids high school students knew what they were doing, and benefited from their actions? There’s not a kid involved who didn’t know what was happening, and he likely told all his friends. Innocence is hard to come by in this. the conference’s action sets a precedent that should raise a red flag to everyone. yet john connors seems unable to notice that giant red flag waving in his face. the student players who actually live in bellevue and aren’t ringer recruits can still play football for bhs. the moron adults who were so obsessed with reflected glory should apologize to those players for causing them to be dq’d from the playoffs but instead so far seem to be doubling down on stupidity and missing the chance to admit their misconduct and seek forgiveness from the honest players and their families. or everyone could wake up and realize that football is not good for boys (or girls) and drop the damn sport altogether. Easier to demonize the WIAA — which indeed deserves it — than to admit error. Bellevue football boosters intend that money (lawyers and lawsuits) will get them out of this trouble. “don’t punish the kids.” You already did.